Finding cheap flights can be such a tedious process. Right? No doubt you’ve felt frustrated with flight search engines before. You quickly find yourself with a hundred browser tabs open and just wanting to pull your hairs out. 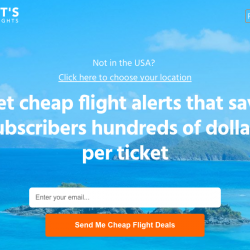 But searching for cheap flights doesn’t have to be that frustrating! By using the right tools, you can find the best options quickly. And by using the best search methods and tricks, you can save yourself a lot of time and a lot of money. Follow this guide and you’re sure to become a flight searching ninja! First, let’s dispel a myth. No, it doesn’t matter if you use private browsing mode when looking for flights (on any reputable sites). It’s possible some search engines may have used nasty tricks in the past, like increasing the price if they detected you were searching for a destination often. But most likely, these were only rumors based on naturally fluctuating prices. Browsing in private mode or deleting your cookies will not get you better prices. If prices change, it’s because the airlines changed them. Every traveller seems to have their favorite search engine. 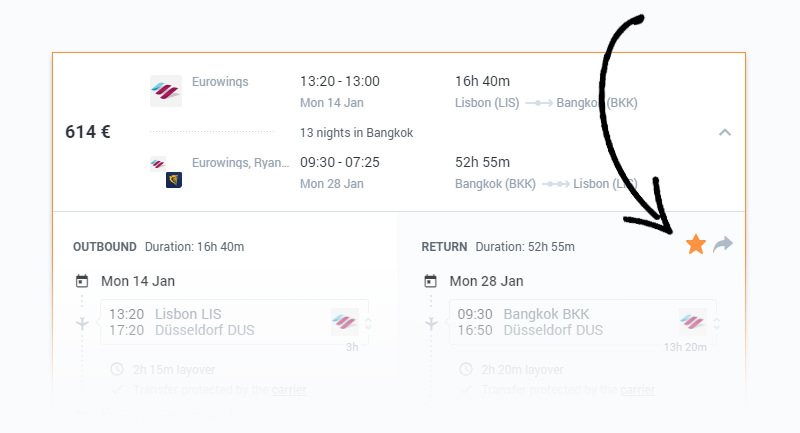 I think Skyscanner, Momondo, and Google Flights are all pretty great. It’s always worth checking a few different sites, but lately I have truly come to love Kiwi. They are like the Tesla of flight search engines. They’re kicking everyone’s butts right now. Also, they handle bookings themselves. On Momondo and Skyscanner, you’re often forwarded to other sites with questionable customer service like Mytrip, Bravofly, or Gotogate. I’m recommending Kiwi simply as it’s awesome and I love using it. I’ll be using Kiwi as an example for the rest of this article. Important: sites like Kiwi, Momondo or Skyscanner are best used as research tools. Whenever possible, I still recommend booking the actual tickets directly with the airlines — for reasons I’ll explain a bit later. Do you want to fly somewhere cheap but you’re not sure where yet? Well, you can get a rough idea of the prices. You’ll get a map that looks kinda like this. As you may already know, flexibility is key when it comes to finding cheap flights. The less attached you are to particular dates, airlines, or airports to fly into, the cheaper you can fly. If you already know your origin and destination, you can increase your chances of finding a good deal by including nearby airports. This used to be a tedious manual process. But with Kiwi, it’s easier. Right-click anywhere and select ‘Flight to here’. In both cases, you’ll now get a catchment circle that you can expand or contract depending on how flexible you’re willing to be. Well, the cheapest airport to fly is not always the most obvious one. For example, if you’re flying to Malaysia, it might be much cheaper to fly into neighbouring Singapore instead of Malaysia’s capital of Kuala Lumpur. If you’re going to Albania, you’ll have better luck flying into Curfu in northern Greece than to Tirana, which has only a very small airport. And if you’re going to the Netherlands, it might be much cheaper to fly into Eindhoven and then taking a train than flying into Amsterdam. Drawing a circle on the map is the quickest and best way of finding any alternative departure or arrival points. Here’s an example of a radius search. If you already know roughly when you want to travel, then changing your departure and return by just a few days can give you huge savings. Again, finding this out used to be a manual affair. You had to try loads of dates and keep a billion browser tabs open. But now it’s much easier. With a departure and destination airport already set, click the date field to see lowest prices for each day. With your departure and destination airport selected, click Date Range and/or Time of Stay. Kiwi will now search for the cheapest flights at any time within the limits given. 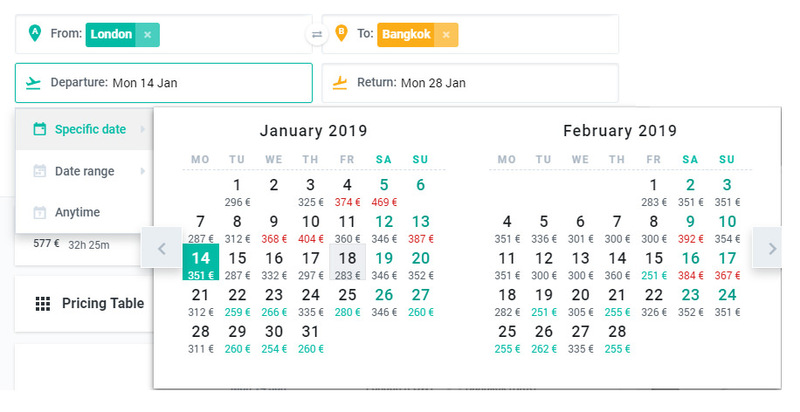 Okay, so the above trick is nice for optimizing your departure and return dates when you already know roughly what time of year you’ll be going. But what about viewing the bigger picture? How could you know what time of the year is the cheapest to go? After all, some destinations are highly seasonal, with flights becoming easily twice as expensive in certain months. A great example is the month of August all throughout Europe, when many people take their summer holiday and prices go through the roof. Going in the shoulder or off-season can save you a ton of money. This is the only thing that Kiwi is not yet so good at telling you. I recommend jumping to Momondo briefly to find this out. Momondo has a cool feature called Flight Insight, which lets you take a deep dive into the cost variables for a particular route. In a nutshell, here’s how to use it. You will see a graph showing all the factors affecting price, including seasonality, time of booking, day of the week, and airport. Hit the Seasonality tab for a graph showing the cheapest and most expensive months of the year to travel this route. Okay, hold onto your hat, as we’re about to enter power mode. 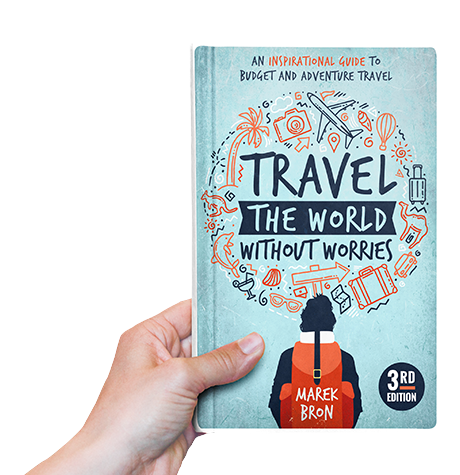 Are you planning a round-the-world trip? Or planning to hop around a continent over a longer period? Or are you a nomad spending a month here and there depending on price? Then you will surely love the Nomad search feature on Kiwi. This is a much more powerful search feature than a normal Multi-Stop search. It’s like making a wishlist of destinations and letting the search engine figure it all out. 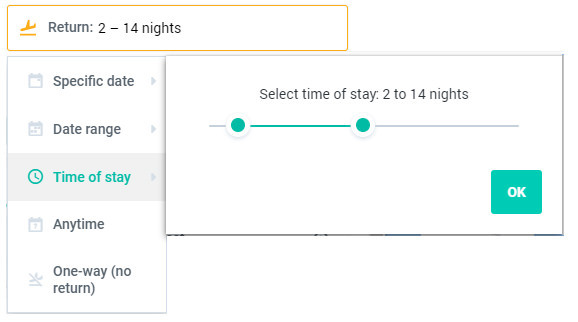 With Nomad search simply enter the places you want to go, select roughly how long you want to stay there, and Kiwi will take care of the rest. It will figure out the ideal time, order, and flight paths to get you the cheapest possible total package. It’s just beautiful. I… I think I have something in my eye. One current limitation is that the maximum stay in each place is 31 days, which might not be ideal for certain round-the-world travellers or nomads who are taking it slow. Nevertheless, it’s the most powerful multi-stop search tool I know of. Have you been searching for a while and have you stopped seeing the forest for the trees? While browser tabs and bookmarks can help you remember your previous flight searches, you can also use the features designed specifically for this. This will help you stay on top of any price changes without having to constantly search again. Just click Create a Price Alert. Hit the star icon next to flight options with potential. You’ll find them all under your Starred Trips. When you come back to this overview later, the Status column will show you if anything has changed for this route or its price! As you might have noticed, I love Kiwi. Kiwi is unique in that it sometimes displays multi-stop flights with multiple carriers (that don’t already work together through a codeshare). Normally this would mean that if Flight A gets cancelled or delayed, you’re not entitled to a refund or rescheduling for unrelated Flight B. For these situations, Kiwi offers its own guarantee. This is a new way of doing things, so you might find some customer reviews complaining about it. Just make sure you understand what you’re booking! Then the flights are a normal one-package kind of deal. Then it means Kiwi got creative and put together two single tickets that normally aren’t sold together. For transfers protected by Kiwi, I recommend leaving plenty of time at the airport in case of any delays. If you don’t like this way of getting cheaper tickets, go with transfers protected by the carrier. 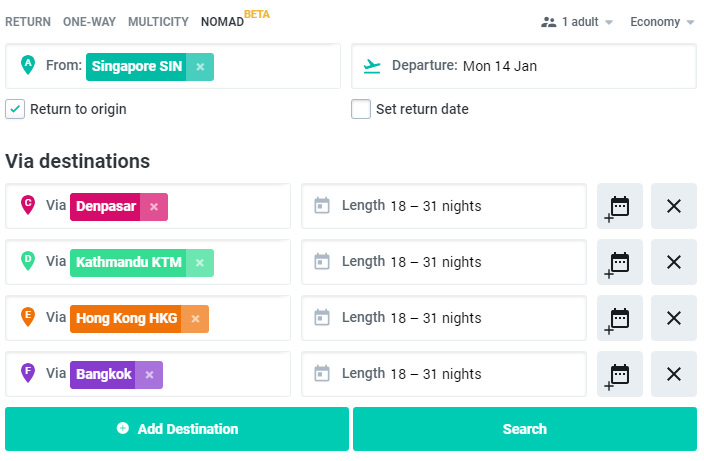 While sites like Kiwi, Skyscanner and Momondo are awesome tools, you don’t always necessarily need to book through them (nor the booking sites they send you to). For the virtual interlining combinations on Kiwi, it definitely makes sense, but for other point-to-point flights, you may want to check with the respective airline directly. Here’s why: not all of the customer service or options you get with an airline directly will always be passed on to you by the intermediary. For example, I once had to cancel a flight I’d booked on Kiwi. The airline itself (Vietnam Airlines) offered free cancellations. But Kiwi did not offer that free cancellation, and could only refund a pitiful $5 of the total ticket price. Another time, I booked a flight through an intermediary and they charged 3 times more for adding more luggage allowance than the airline itself! That’s why you should always check if the airline offers the same deal on their own website. Whenever possible, it’s usually best to go straight to the source, if the price is the same. Only use 3rd parties if they are much cheaper or if they offer other benefits, such as guaranteeing your connections on a multi-stop flight. 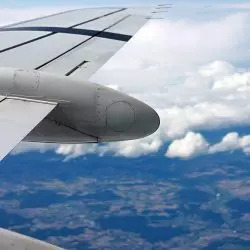 According to research published by both Skyscanner and Momondo, the optimal timeframe to buy tickets is usually 5 to 6 weeks ahead of departure. This is just a rule of thumb. But my personal rule is this: the best time to book is when you find an amazing deal. I don’t think it’s a good idea to just sit around waiting until it’s 1½ months until departure. The key to a good price is typically not to leave it waiting until the last minute. I have often kicked myself for not booking what was clearly a sweet deal, then seeing the prices go up a week or two later. The WORST time to book is within 14 days of flying. Don’t leave it too late. There’s one more tip I have for you. When you get to the seat selection, it’s worth checking the site Seatguru for up-to-date airline seat maps. Seatguru can tell you which seats are best. 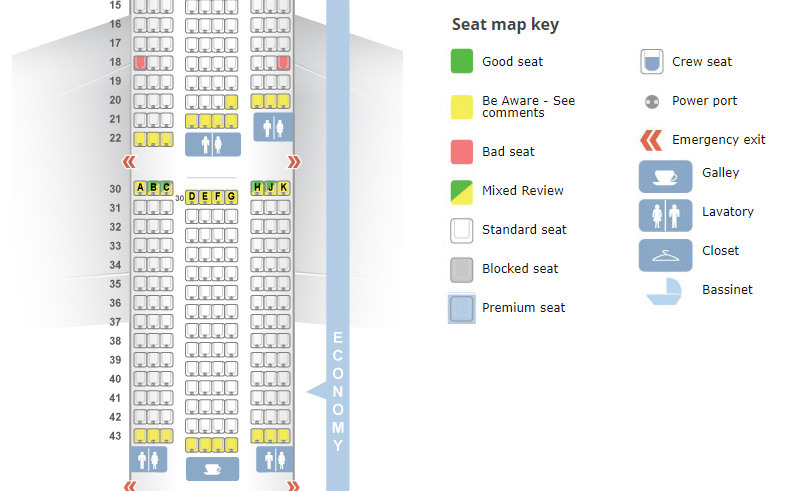 For instance, some regular Economy seats might be next to exits where there is more leg room than usual. Some seats are close to the toilets, bulkheads, or galleys, or might be missing a window, and are better to avoid. If you’re planning a one-way trip, it can sometimes be cheaper to book a return. Due to how the airline industry works, returns are sometimes cheaper than singles. In that case, you can just use the first segment and not use the return trip. It’s always worth having a quick look to see if there are any attractively priced return flights. 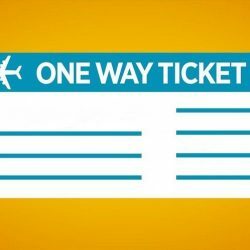 Keep in mind that flying on a one-way ticket can cause problems. Airlines can get fussy about this. You might have to show your visa and proof of onward travel. This will reassure the airline that you’ll be allowed into the destination country. If you get denied entry at immigration, they’re liable for flying you back. So if you’re on a one-way ticket, they want to be sure this won’t be happening. There are ways to hack around this though, as I explain in a separate guide. A layover is a short stay in a transfer city on your way to your final destination. I’ve grown to love layovers! This year I spent time in Singapore, Beijing, and in Istanbul (between 18 to 36 hours) on my way to other destinations, as I was passing through there anyway. Layovers let you double your destinations on your holiday, and it’s possible to do without any added cost in airfare. 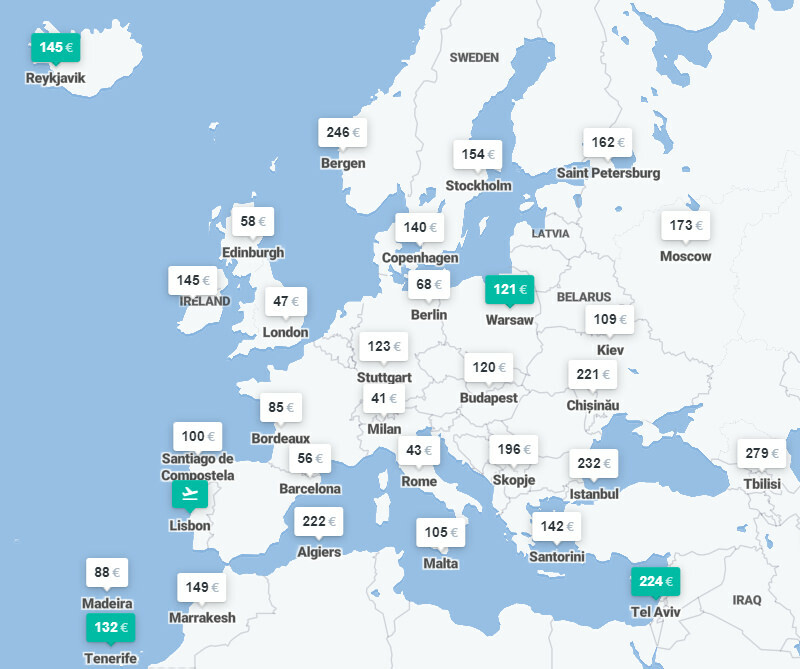 You can get a rough sense of where you could insert a layover by scrolling the results and seeing which cities are used for indirect flights. Planning a layover is a bit more complicated than planning a regular trip though. I can tell you a lot more about this in my dedicated guide to planning layovers. You may have already heard about the phenomenon of ‘mistake fares’. These are ridiculously cheap flights that were offered by mistake, or they’re just super cheap due to a flaw in airline reservation systems. These fares do show up on sites like Kiwi or Momondo, but they are very hard to find. And they also often disappear within a day or two. To catch them, it’s best to subscribe to a mailing list that will send you alerts about these mistake fares. My personal favorite is Scott’s Cheap Flights. You can read how to find mistake fares here. These kinds of services have exploded in popularity though, so you have to be lucky to catch one of the deals! There is also often some catch, like a very long layover, or having to go the long way round. Not all airlines are listed on the usual search engines. This is especially true for obscure destinations, or developing countries. I mean, London to Berlin — sure. But flights between Dushanbe and Tashkent? You might not find all the options with just a search. Sometimes it can still be a good idea to search manually. And in these cases, surprisingly, one of the best tools you have for this is Wikipedia! It can tell you very quickly which routes between airports actually exist. I often like to type in the name of my origin airport on Wikipedia as you’ll often get a detailed table showing which airlines fly there and on which routes. This method was very useful to me when flying on less obvious routes. For instance, I found flights this way to some obscure islands in the Philippines, with some small domestic carriers that search engines haven’t yet included. 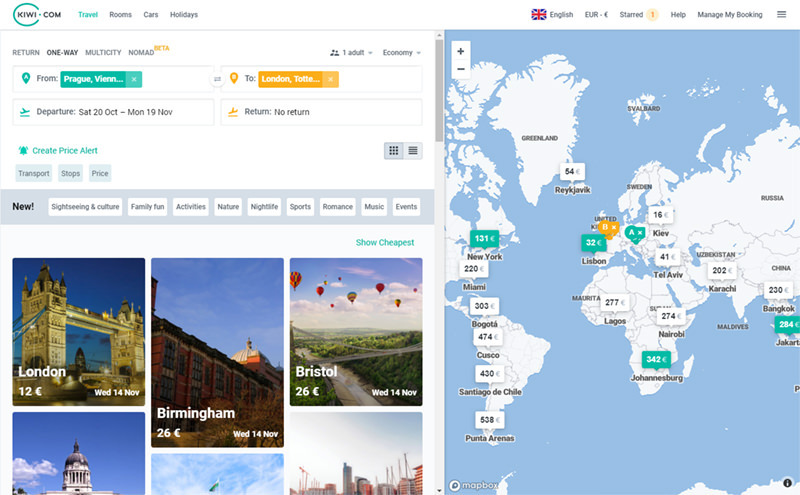 You can use the widget below to start searching for your next trip! P.S. This post includes some affiliate links, so if you book a flight I get a small commission. I hope my tips will help you get an awesome deal for your next trip! 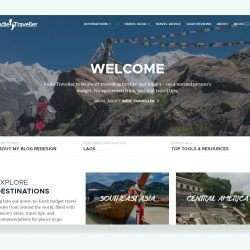 Some very good tips there, I have used all the search engines listed but I must admit my preference is Momondo, may be I’m stuck in a rut… One thing I would like to add is that on finding the flights I want to book, I invariably book them direct with the airline, it saves a few pennies here and there. Not doing this and using the links from the search engines can take you off to some obscure travel agent so he can make his commission. I made this mistake last year when doing a visa run from Bali back to Flores via Kuala Lumpur and Jakarta. Even though I had a conformation email of my flight with Garuda from KL to Jakarta and the on to Flores. I was not booked onto the flight, luckily I had not been charged and had to buy the flight again in the airport. I used to use Google Flights but ever since I found Kiwi I don’t use anything else. It’s just so good. Awesome tips. 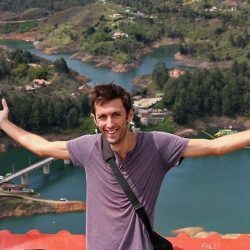 Cheap flights are important to me as I like to travel as often as possible. I am going to implement your advice – especially those mistake flights. Thank you!